Surely it was her spiritual destiny landed her safely into India unscathed and undetected. At Rawalpindi, Gulrukh led an ascetic life for some years, and eventually came into contact with a Hindu saint, who initiated her into the spiritual path. After this initiation she went into seclusion in a nearby mountain outside Rawalpindi and underwent very severe penance for nearly seventeen months. Thereafter she came down to Punjab and stayed a few months in Multan. It was in Multan, while Gulrukh was 37 years of age, that she contacted a Muslim saint – a Mazjoob (immersed in Divinity) who put an end to her spiritual struggle by giving her God-realization. Gulrukh once again wended her way to Rawalpindi, and there she was again spiritually drawn to the same Hindu saint, responsible for her first initiation. The saint helped her to come down from the super conscious state of God-realisation to the normal consciousness of a Master. Hereafter for Gulrukh began a long trail of journeys from one part of India to another. In one of her itineraries she visited Bombay, and after a few months’ stay in Bombay, went back once again to the Punjab, and spent a good number of years at different places in Northern India. It was at this time that she happened to utter in a moment of ecstasy words connoting her divine state. This was treated as blasphemy by orthodoxy, which, with the connivance of the church, got her buried alive Gulrukh miraculously, survived this ordeal, and finding the country unsafe for her she bade good bye to the Punjab and Northern India forever. She travelled south to Bombay took up her abode in a locality know as Chuna Bhatti near Byculla. Bombay however, was not to be graced by her presence for long and the enviable honour of manifesting Gulrukh’s spiritual greatness goes to Poona, that the sepoys of the Baluchi Regiment, which had only recently arrived from the North and who knew that Gulrukh was buried and dead, had a surprise of their life to find her all alive and seated underneath a neem (margosa) tree at a place called Malcolm Tank within Cantonment limits. The Baluchi sepoys looked upon this as a great miracle, and thus feeling convinced of her spiritual greatness, gave Gulrukh an ovation, by bowing to her reverently. After this incident her saintly fame spread far and wide, and she came to be universally known as Hazrat Babajan. Sometime after her entry into Poona about the year 1903, Babajan had no fixed place of abode. She was seen sitting or resting at odd places in different parts of the city and cantonment. Although shabbily dressed, there was something magnetic in her personality very unusual in a street mendicant that she looked, that no passer-by could resist giving her a second glance. She was seldom seen moving about or sitting anywhere all alone. Her bodily requirements were very few, and food she ate very sparingly at long intervals. She was very fond of tea, which was offered to her very frequently by visitors. While walking in streets, on whomsoever her eyes feel that person could not but halt or stand up reverentially unit she passed by. An unsettled life of some years in and around Poona saw Babajan at last settled at a spot near Char Bavadi, Malcom Tank, underneath the neem (margosa) tree. At this time the locality mentioned was a picture of dirt, desolation and ugliness. The Cantonment authorities became alive in the situation, and had it been possible they would unhesitatingly have had Babajan shifted to some out of the way spot. But they dared not risk a public demonstration in the matter. By now Babajan’s fame as a saint hand spread far and wide and ‘Char Bavadi’ became a place of pilgrimage for people from all over India. In place of Babajan’s shabby shelter, when the new structure which was only a few feet away from Babajan’s original seat was ready to every one’s surprise, she refused to be moved there. The awkward situation however, was got over by extending the structure a little more so as the include and embrace Babajan’s original seat, as well as the neem tree. When Babajan first came to Poona people surmised her age to be not less that 90 years, and thereafter even 30 years added to her life in the city wrought no changes in her personality. Short in stature, firm and agile fair and sunburn, face broad and heavily wrinkled, high cheek bones, liquid blue eyes possessing great depths, head covered with a silvery crown of thick white hair hanging loose up to the shoulders, deep sonorous voice, all conspired to make her personality very unique and unworldly. Her attire was simple, consisting of a long apron extending below the knees, a pyjamas narrowed round the legs and a linen scarf thrown carelessly round the shoulders. Babajan slept very little, one day she would feel out of sorts, at times even high fever, and the next day she would be her usual self without recourse to any medication. Young and old, male or female, she used to address everyone as Bachcha or Baba (child). Her method of healing was quite unique and entertaining. When anyone approached her for a cure, she would hold between her fingers, the painful or diseased part of the person concerned, and calling upon some imaginary being, simultaneously ordering the troublesome entity to quit. Surprisingly enough, this funny operation would impart instantaneous relief. A Zorastrain child aged about 10 years had lost his eyesight altogether. His guardians brought him to Babajan, and when told of the sorry plight of the child, Babajan mumbled some words, and blew her breath upon his eyes. The child immediately recovered his eyesight and began to jump about joyfully saying “I can see now, I can see”. One Hindu woman, a devotee of Babajan very humbly and supplicatingly submitted to Babajan that she was married over ten years, but was not yet blessed with an issue. She requested Babajan’s blessings in her case. Babajan blessed her, and said. “Your first issue would be a son.”. Exactly after a year and half, the lady returned and placed the male baby at the feet of Babajan. Babajan took up the child in her arms, played with it for some time, and allowed the mother and the child to depart with her blessings. Babajan’s love and charity towards humanity was supremely Divine in expression; it could not but reclaim a most confirmed sinner and subdue the cruellest of minds. Articles of clothing and other presentations to Babajan, people would remove without her permission. Once a man tried to steal a costly shawl covering her body while asleep, but he found its removal rather risky, as some portion of it was held underneath her body. Babajan instinctively raised herself bodily a little, thereby helping the thief to achieve the purpose. On another occasion, a person from Bombay, in token of his fulfilled desire, placed two bangles of solid gold round Babajan’s wrists. At the earliest opportunity, an unknown person snatched away the bangles so very roughly that it gave her wrist a nasty cut which bled profusely. Hazrat Babajan‘s spiritual status in the hierarchy of saints is that of Qutub. Literally the word Qutub means a peg or a pin, and a Qutub functioning on the physical plane is the hub round which the universe revolves. 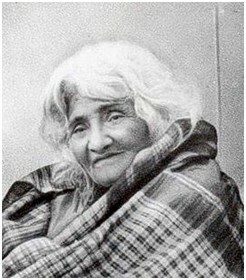 After a spiritual sojourn of about 35 years in Poona, Hazrat Babajan left her mortal coil on 21st September 1931 at the ripe old age of 125 years. Her funeral procession was tremendous affair, never accorded to any dignitary or royalty in the annals of Poona. Her remains were laid at rest at the very spot underneath the neem tree where she sat and dispensed Divine Grace for such a long number of years. Babajan’s seat being in the Cantonment area, everyone though that the military authorities would refuse permission for Babajan’s burial within their limits. The trustees saw and proposed many sites in different parts of the city, but there was no unanimity amongst them about any one particular spot. One day they decided to approach Babajan herself and settled the question of her burial ground direct. No sooner they approached her, Babajan flew into rage at the sight of them and said, “Get away from here. How can the dead show concern for the living? I am not going to leave this place.” Thus Babajan decided the question of her burial ground at the same time conveyed to them that materially – minded people are more dead than alive.